If a fire ensues on your commercial property, time is of the essence. We know from our work in fire alarm monitoring and with OPEN ACCESS™ how quickly a fire spreads: A fire doubles in size every minute after the first four minutes. From evacuating the building to notifying the first responders, someone needs to take charge to ensure that an emergency is not made worse by an inappropriate action or response. That’s where an office fire warden comes in. Simply put, the office fire warden is responsible for implementing a company’s fire safety plan, ensuring that everyone is aware of the emergency procedures, and is the point of contact for first responders. In the case of a fire, a fire warden will ensure that an office is cleared and the authorities are called. 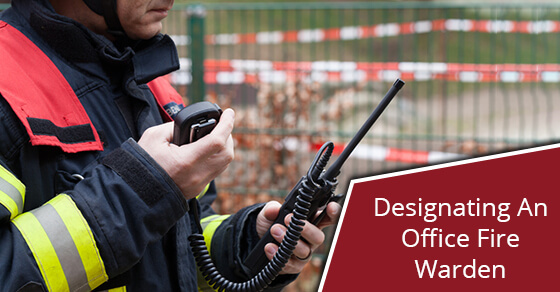 What follows is a look at the role of office fire wardens so that you can see the need to designate a person to this important position. Proactive in assessing possible fire hazards. It’s definitely important that you have a fire warden in your office. The threat of fire hazards is always a real and present possibility that you need to be aware of and plan for. And while a fire alarm monitoring system will help to protect your business, you also need to appoint an office fire warden who will spearhead the evacuation.